Want to improve your French vocabulary? This is the app for you (if you enjoy crosswords that is 😉 ). Tap on any non black square in the crossword grid to highlight all the associated cells and the clue. The clue is in English, your answer should be the French word. For example, the clue is “bag”, the word you should put in the crossword is “sac”. Tap on a square again to toggle between across and down clues. Stuck? Tap on the eye icon, above the keyboard, on the right. It will revel the currently highlighted word for you. Tap on a clue to highlight the squares. 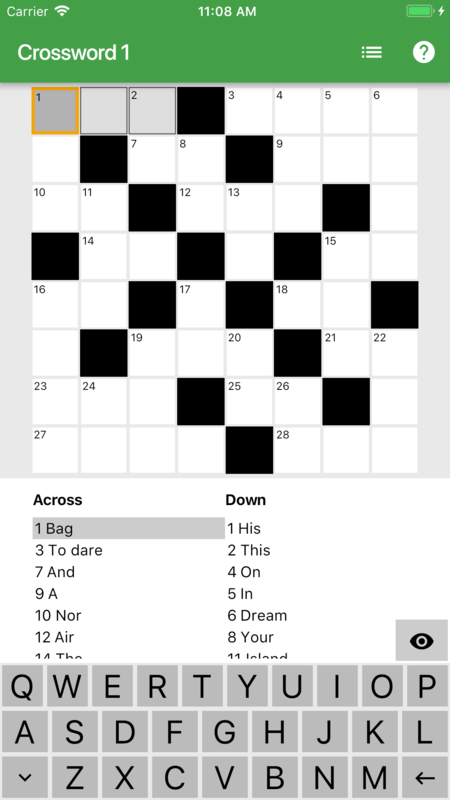 Tap on the list icon, top right of the screen, to the left of the question mark, to view all the available crosswords, as well as your progress. Tap on any crossword to do it. You can also reset a crossword data to redo it.